SUSSEX VISIT – A VERY BUSY WEEK! As can be seen from the previous posts, last week was exceptionally busy and productive for us. With three activities to attend, we were already looking forward to an exciting week. But we had no idea of the surprises in store for us along the way. Monday evening’s presentation to the students at Pestalozzi was the best to date. We have very much enjoyed giving this talk each year but we didn’t realise how much interest is now being generated. We could not have been more pleased with the responses from this meeting. A larger audience attended this year and there were more former early Pestalozzi children present. It was also especially rewarding to have some guests who were former carers and teachers in our Pestalozzi lives and who had travelled a significant distance for the evening. This was also the first time Dr Craig Fees (of the Planned Environment Therapy Trust), our supporter and friend, had actually been able to visit our former surrogate home and see what all the fuss was about. 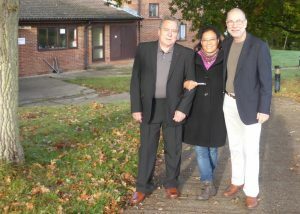 Will & Len with former early Pestalozzi girl Youdon Lhamo. Tuesday provided a completely unexpected event. In the afternoon we “bumped into” Tibetan former early Pestalozzi child Youdon Lhamo! We had had no contact since leaving Pestalozzi in 1966. A practising midwife, Youdon had planned to visit the Village to meet the current students and tell them something of her life. It was a real pleasure to sit down with her and talk over our Pestalozzi memories and our subsequent journeys. 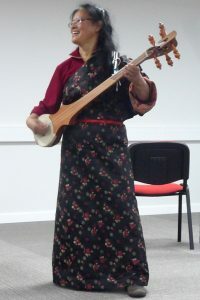 Former early Pestalozzi girl, Youdon, demonstrates her skill on the Tibetan lute during a presentation at Pestalozzi last week. On Wednesday evening, we attended the “Business Meets Students” session which introduced the students to the idea of networking opportunities. We were also lucky enough, afterwards, to attend Youdon’s captivating presentation, along with a delightful performance she had arranged with four of the current Tibetan students. 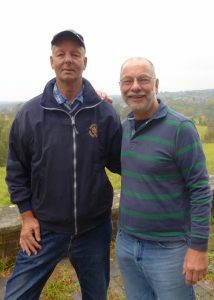 Len (r) – a surprise meeting with former school-friend, Charlie Fellows. informal discussion about our early lives at Pestalozzi. After an enjoyable hour with them we were about to begin our journeys home when Pestalozzi staff member, Fay, announced her father was coming in to see us. This turned out to be none other than former Sedlescombe local, Charlie Fellows, who had been Len’s school chum at Claverham! Once again, there was a lot of nostalgic conversation. All these wonderful moments throughout the last week have reinforced (yet again) just how important Pestalozzi was in our lives – as well as in many other people’s. 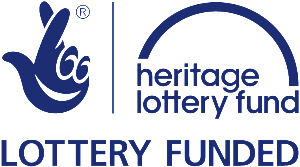 Again, our thanks go to the Heritage Lottery Fund for their vital support through their Sharing Heritage grant.